Rode roos, Carel Adolph Lion Cachet, 1874 – 1945. Courtesy Rijks Museum. On June 18, 2015, Pope Francis officially released an encyclical–the highest level of teaching in the Catholic Church–regarding the responsibility of humans to reconsider our rightful relationship to the natural (human and non-human) world in which we find ourselves and to which we are inextricably linked. You might like to read this easy-to-find primary source on the web or buy a bound copy of the “Encyclical Letter Laudato Si’ Of The Holy Father Francis On Care For Our Common Home”. The encyclical was remarkable in that it directly spoke, as a matter of essential teaching, to 1.2 billion Roman Catholics globally. The release was also timely in that it appeared a few months before the December 2015 U.N. Climate Change Conference in Paris. The N.Y. Times reported, “News media interest was enormous, in part because of Francis’ global popularity, but also because of the intriguing coalition he is proposing between faith and science.”(1) Certainly, there has been great joy among environmentalists and many others who have felt that they were isolated voices crying in the wilderness and struggling to get traction with centers of political power and consensus-manufacturing media. Pope Francis’ bold clarion call in Laudato Si’ is passionate but also thoughtful and undogmatic in exemplary ways. Even while summonsing the best conclusions and consensus of the scientific community, there is a tone of humility and a recognition that knowledge is always partial and emergent. Yet, the pope advances a strong commonsense plea for global and decisive response to climate change rather than adopting a wait-and-see attitude. He calls for inclusive dialogue that is transdisciplinary and ecumenical. He invites scholars, scientists, and atheists to join in conversation with those from indigenous traditions, Abrahamic faiths, and Eastern religions. He does this for reasons that transcend the pragmatic one–that we simply need all-hands-on-deck in this emergency. Instead, he understands that there must be a melding of technical capacity and scientific knowledge with dialogue about what we as a world community have valued and will value and that this multi-perspectival dialogue should inform our path as we enter a time of inevitable change. The pope himself proposes an integral ecology and cogently argues for the intrinsic value of the entire natural world and the inherent interconnectedness of all things. “A prayer for our earth All-powerful God, you are present in the whole universe and in the smallest of your creatures. You embrace with your tenderness all that exists. Pour out upon us the power of your love, that we may protect life and beauty. Fill us with peace, that we may live as brothers and sisters, harming no one. O God of the poor, help us to rescue the abandoned and forgotten of this earth, so precious in your eyes. Bring healing to our lives, that we may protect the world and not prey on it, that we may sow beauty, not pollution and destruction. We thank you for being with us each day. Encourage us, we pray, in our struggle for justice, love and peace. . . . The voice of Pope Francis presents a clear case for nature’s claim upon us, even as it calls us to love of our world and all that is in it. Yet, each time I reflect on the call of Pope Francis for inclusive dialogue as the path that can lead to discernment and commitment to the common good, I find myself asking a central question: Is this tool (of inclusive dialogue–often drowned out by shouters and distorted by its abusers) up to the task? It is a critically important for public voices to explicate assumptions, to examine truth claims in light of the evidence, and to arrive at appropriate and specific conclusions! For these reasons, I’d like to discuss a few examples of the predictable pushback aimed at Pope Francis and to disarm some of the formulaic, responses that repeatedly serve to distract our culture from considering the Pope’s central thesis and weighing the validity of evidence emerging from all quarters. Claim: The causes of climate change are complex. Because we do not know precisely how much is due to manmade activity, we should do nothing. Claim: The pope’s emphasis on altruism is misguided. Instead, given the reality of human selfishness, we must allow the free market to solve all problems. Response: Those who argue in this way do not mean simply that we should create financial incentives to achieve environmental goals. Rather, they seem to imply that, if a certain choice doesn’t result in the highest profit, it is not a valid option. But acknowledging certain efficiencies and incentives intrinsic to capital markets is different from elevating a narrow profit-driven perspective into a guiding principle for our relationship to the living world. Can we not easily imagine many circumstances in which market-driven solutions, predicated on profit and unrestrained growth, are unsustainable? Doesn’t common sense tell us that resources are finite and, therefore, infinite growth is impossible? Doesn’t this suggest that the natural world and the claims of future generations extend beyond the boundaries of a monotonous profit-counting and inhabit a reality well beyond the reach of economics? In a zero-sum game–as reflected in the finite supply of natural resources–won’t the world need altruism, self-restraint, connection, imagination, creativity and dialogue to live in harmony with the natural world and to craft a sustainable future for the next generation? Claim: The pope is a “hypocrite” for questioning modernity while relying on Carrier, Inc. to air-condition the Sistine Chapel and to preserve its art treasure. Response: We must recognize that, rather than addressing the pope’s claim by fact-checking the pope’s evidence or presenting contradictory evidence, the labeler is aborting the discussion by launching a diversionary (ad hominem) attack. To understand how the “hypocrite” label is irrelevant, consider this analogy: A bicycler can claim that 255 million gasoline-powered vehicles on U.S. highways are not sustainable and so can a commuter driving 100 miles/day in a gas guzzling SUV. The truth or falsity of the claim is independent of the person uttering it. Don’t we suppose that many Americans are driving SUV’s and using Carrier air-conditioners even as they come to grips with the question of sustainability? Typically, all of us change our minds and imagine new solutions long before we invent new options and change our habits. The truth or falsity of a claim is independent of the practices of the person who makes the claim. Response: We should note that this label and (ad hominem) smack-down approach is simply a veiled attempt to divert attention from the legitimacy or illegitimacy of another’s claim. Labelling is not the same as dealing with the argument and it is not a sign of strength. Instead, it’s a clue that the labeler has no argument. When numerous public figures forego dialogue and substitute this kind of bluster, it lethally thwarts the process of democratic engagement and discernment. Sadly, I fear it is a sign of entrenched, stubborn and difficult-to-redeem attitudes. The tone of the encyclical–meek and mild, graceful and understated–is quite the opposite of those for whom labels and smack downs are everyday tools. The pope describes an integral ecology in which all things are deeply connected. He also establishes a basis for reverence for life, not in fickle sentiment but in the value inherent in the universe. It is a welcome paradigm grounded in reality. Many whose hearts enfold our planet are thankful for this beautifully crafted call. Likewise, we acknowledge that the pope’s gracious and inclusive invitation to dialogue is a model for this current age. The Pope’s encyclical is definitely worth a read, especially for those of us who are non-Catholics. 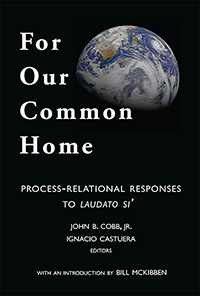 Also, check out one of the first books published in response to the Pope’s encyclical, For Our Common Home: Process-Relational Responses to Laudato Si’, published by Process Century Press and edited by John B. Cobb, Jr. and Ignacio Castuera. This is what constructive dialogue looks like.